..... the centre of the glass universe! Andy McConnell, a widely published journalist with more than 40 years’ experience in glass, has been the BBC’s Antiques Roadshow’s glass specialist since 2005. He also lectures on the subject, owns about 30,000 pieces & runs Britain’s largest glass gallery in Rye on the Sussex coast. This encyclopaedic new edition ofThe Decanter, Ancient to Modern bolsters the book’s reputation as the definitive work on the subject. Researched, written & composed by Andy McConnell, The Decanter is born of 20 years’ research. It is enlivened by many new chapters and the inclusion of 2,650 photographs & illustrations, most previously unpublished. In presenting the subject across a broad timescale - spanning ancient Mesopotamia to the modern day - The Decanter explores the history of glassmaking from a decanter perspective. The engaging, accessible text explores the stylistic & technical evolution of fine glassmaking alongside its influences & social uses. Drawing from documentary sources & the input of experts in Britain, Europe & the US, The Decanter is the most comprehensive history of fine glassmaking ever published. Signed copies can be bought direct from Glass Etc for £60. Or though eBay for £60 plus shipping. Decanters have always been favourites for designers. What an impressive array of individuals … fantastic portraits of a neglected group. Bertil Vallien. Designer: Boda, KostaBoda, 1963–, Sweden. Andy’s skill at writing and researching The Decanter will be perused and enjoyed by countless people long after we are gone. A masterpiece! Wayne Husted. Designer: Blenko, 1952–63. United States. Andy’s appreciation of the way glassware reflects the social as well as the physical and aesthetic forces of its making is acute and subtle. His exuberant delight in the infinite capacity of glass to express creativity and practicality is matched by his capacious knowledge. It impels one to select a really good glass, imbibe and then admire. It is fantastic! Full of beautiful, clear images for identification, and the writing is always Informative, sometimes funny and easy to understand. This book is amazing! It will be one of the seminal works in glass field.I will buy it and recommend it to my friends and contacts. Congratulations! I’m so impressed by this wonderful book & the enormous effort it clearly has been to create it. Everyone should have one, I’m indeed happy to have mine ... a true masterpiece. Erika Lagerbielke. Designer, Orrefors Kosta Boda, 1982-. Sweden. Jeremy T Messenger: Holy Moly! I just received this book today…& I am amazed at the amount of information & beautiful photography....If you are interested in glass, this book is the one you need… It is the result of 20 years of work, & every bit of it shows in this astonishing tome. Margarita Rainford: This is a large, heavy & comprehensive book, wonderfully researched & referenced. Denver Edwards: I doubt anyone will ever match this book for sheer breadth & depth of information in this area so if you do miss it you will truly be missing out. Lesley Burnapp: Excellent book. Beautiful photography & really good information & data. If you are a glass lover there is something for everyone in this book. Kevin Barron: This is a great book & a must... It’s really well illustrated, & it’s not just the fancy stuff you see in museums. Chris Parry: It will be of great help to me in years to come. A must for decanter collectors and anyone with an interest in the history of glass. Léonie Thorogood: It’s a brilliant book - full of wonderful photographs, fabulous stories & the endlessly intriguing history of glass. Calvin Wilberger: I have been studying, buying and selling glass for well over 50 years. Your book just arrived today & I had to tell you I am very impressed & happy I took a chance on you. Regan: The Decanter is really about the history of glass & how the art form has developed over millennia, rather than being solely about decanters… The photography is excellent, but it’s the detailed analysis & outstanding index that have pushed this book into my top tier of art reference books. McConnell’s encyclopaedic knowledge of glass must have few equals in the world and we are extremely lucky that he has so carefully reworked this book in its second edition. Martha Bowman: I was impressed with the quality of the book before I even turned opened it. It's not like you can read it in one night. I'm starting to break it in: few pages front to back, a few back to front...this may take a while .. [Yea!] Thank You. Lynn Peterson: This is a gorgeous book. If you are interested in the history of glass making & want to have that history presented in a scholarly but eminently readable form accompanied by the most gorgeous pictures, then this book is for you. 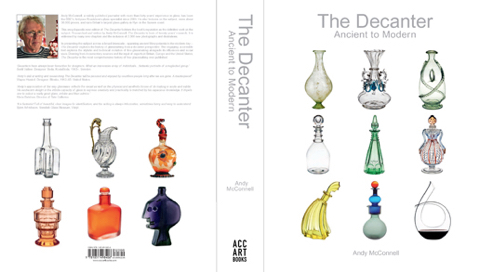 The Decanter, Ancient to Modern [ACC Art Books, 2018]. Both my other published books, The Decanter, An Illustrated History & 20th Century Glass have been out-of-print for several years. 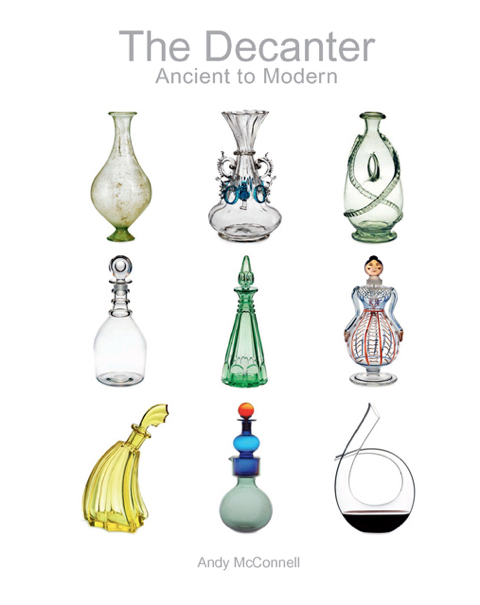 The Decanter, An Illustrated History of Glass from 1650 [Antique Collector’s Club, 2004]. 20th Century Glass [Miller’s, 2006]. Swedish Glass Design [Antique Collector’s Club, release date TBA].